罗巧, 高正辉, 李胜振, 朱芬. 不同食物对大头金蝇的卵巢发育及其产卵动态影响研究[J]. 中国媒介生物学及控制杂志, 2018, 29(3): 246-249. LUO Qiao, GAO Zheng-hui, LI Sheng-zhen, ZHU Fen. 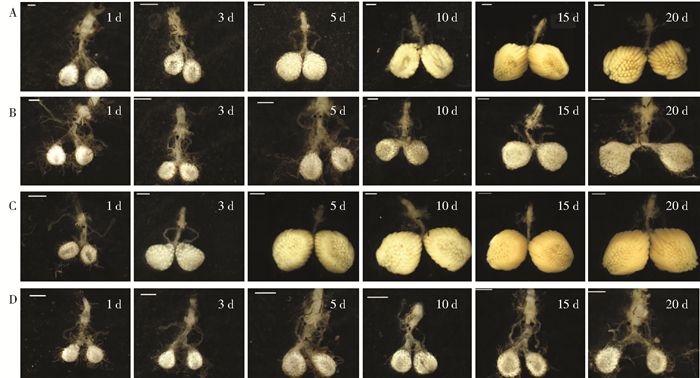 Study on the ovarian development characteristics and oviposition dynamics of Chrysomya megacephala[J]. Chin J Vector Biol & Control, 2018, 29(3): 246-249. Corresponding author: ZHU Fen, Email: zhufen@mail.hzau.edu.cn. Abstract: Objective To know the impact of the blowfly Chrysomya megacephala on different foods on their ovarian development and oviposition dynamics, to provide a theoretical basis for studying reproductive behavior of the flies. Methods After the adults emerged, the females were allowed to feed on pig manure, pork, cooked eggs and powder milk, and the development of the ovary was observed after feeding at different time. One-way analysis of variance (ANOVA)was used to compare the differences in ovarian developmental length when feeding on different foods. Results The flies that fed on cooked eggs and pork, completed ovary development on the 10th and 5th days respectively, while the ovarian development has not yet been seen until 20 days when flies fed on pig manure or powder milk. The ovary length of flies that fed on pork was greater than that in other three groups, the difference was statistically significant (1 d:F=13.054, ν=3, P=0.000; 3 d:F=84.584, ν=3, P=0.000; 5 d:F=42.065, ν=3, P=0.005). The female C. megacephala that fed on pork needed 5 d to complete the ovarian development and began to lay eggs; it began the first oviposition peak on the 7th day, then reached the highest of 16.6 mg on the 9th day, ranging 6.0-10.0 mg. 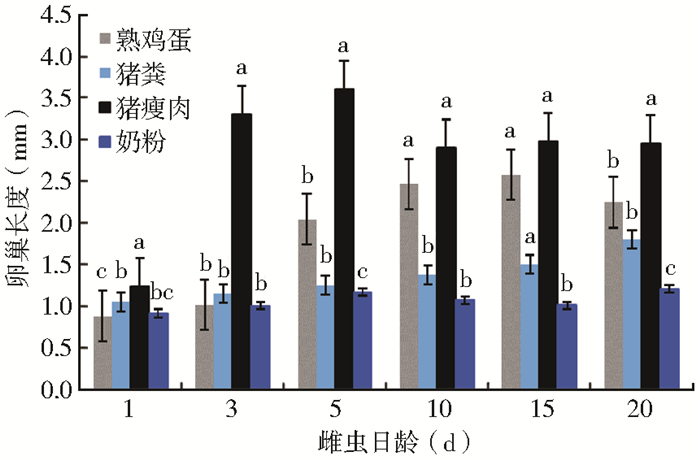 Conclusion The adults C. megacephala which fed the pig manure and milk powder could not complete the ovarian development, the adults that fed on the cooked eggs were slow to develop ovaries. The ovarian development of the pork-feeding adults was the fastest; oviposition dynamics were affected by nutrient sources. 陈若篪, 程遐年, 杨联民, 等. 褐飞虱卵巢发育及其与迁飞的关系[J]. 昆虫学报, 1979, 22(3): 280-288. 宋南, 罗梅浩, 原国辉. 取食对寄生蜂的影响[J]. 昆虫天敌, 2006, 28(3): 132-138. 王俊刚, 赵福, 雷朝亮, 等. 糖对大头金蝇生殖力的影响[J]. 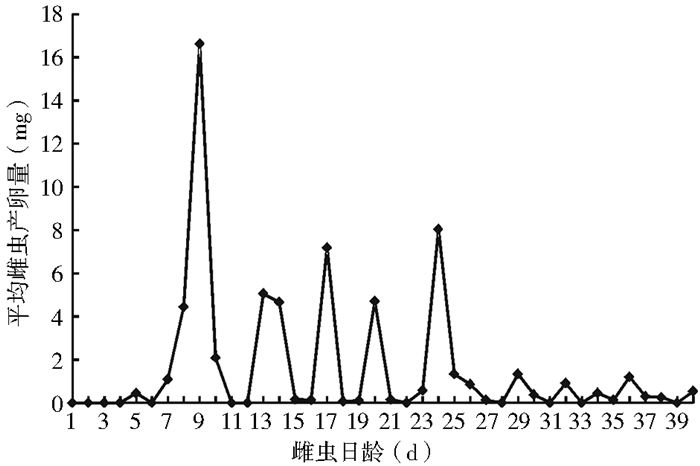 中国媒介生物学及控制杂志, 2005, 16(5): 348-350. 吴少英, 胡萌, 汤清波. 我国法医昆虫大头金蝇的研究进展[J]. 中国媒介生物学及控制杂志, 2012, 23(4): 370-373. 冯炎. 四川西部丽蝇科4蝇种昼夜活动节律的研究[J]. 华东昆虫学报, 2007, 16(2): 105-112, 155. 王小云, 李逵, 朱芬, 等. 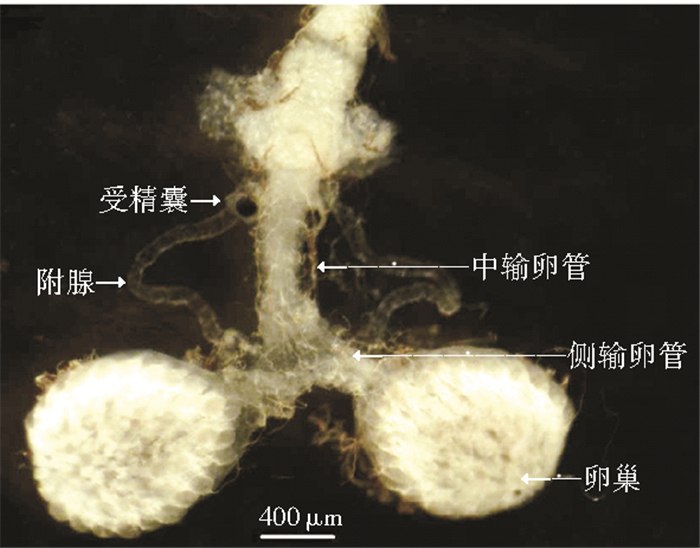 大头金蝇的综合利用研究进展[J]. 昆虫学报, 2016, 59(10): 1143-1150. 武红艳, 杨柳青, 王波, 等. 新乡地区夏季常见嗜尸性昆虫群落演替规律初步研究[J]. 中国法医学杂志, 2017, 32(1): 13-15. 胡萃. 法医昆虫学[M]. 重庆: 重庆出版社, 2000: 183-201. Bansal A, Murad H. Morphology of the female reproductive organ of the oriental latrine fly, Chrysomya megacephala F. (Diptera, Calliphoridae)[J]. Med Entomol Zool, 2016, 38(3): 233-238. 王波, 季清娥, 陈家骅, 等. 不同营养条件对橘小实蝇实验种群生殖力及生命表的影响[J]. 热带作物学报, 2012, 33(3): 551-555. 轩景丽, 陆书龙, 程晓琴, 等. 美洲斑潜蝇成虫的卵巢结构观察及营养影响卵子发生的试验[J]. 环境昆虫学报, 2017, 39(3): 660-666.